The Passive House is designed to achieve maximum solar heat gain by orienting its largest windows with southern exposure with the intent of providing at least 50% of the building’s heating demand. While this works well in the winter months when the low angled sun radiates heat into the space, this solar radiation becomes excessive during the summer months and needs to be shaded. Bay Screens provides both exterior and interior shades with the needs of the Passive House in mind. 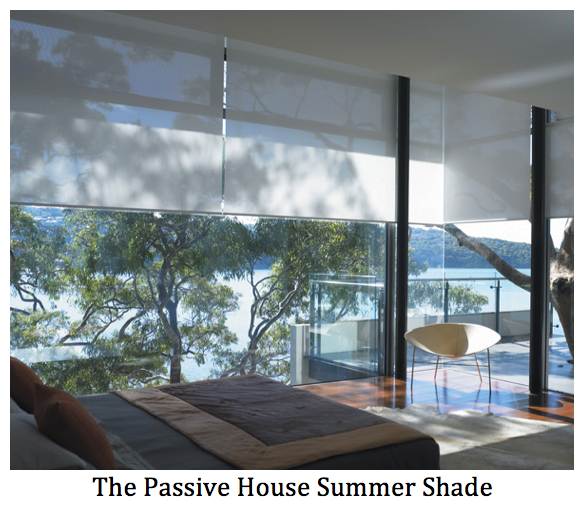 Even though exterior shading solutions are preferred, they may not be possible for a variety of reasons, such as, “we never planned for exterior shades, now it’s too late”, or “we don’t have a budget for motorized shades”, or just simply “we don’t want exterior shades, we want interior shade”. To offer an interior solar shade for the Passive House, one of the key features must be is that it must significantly reduce solar heat gain from entering the window. This is done through the type of roller shade fabric. 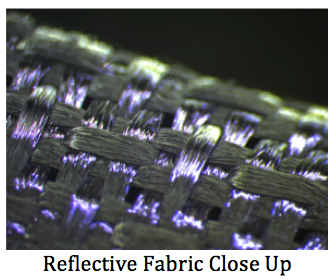 The best interior shade fabric that provides a solar heat gain coefficient that comes close to an exterior shade would be a reflective coated fabric.